The garden was started by Bill Landis, head of the nutrition, health, and human performance department, and Aaron Schletter, grounds manager, following a sabbatical by Landis. sound food production. The garden provides an excellent area for student research with a direct connection between garden activities and academic courses across campus. The Dickson Foundation’s mission is to support education and the Foundation has a long history of helping Meredith starting in 1979 giving an annual gift, and continuing with the last two fundraising campaigns. 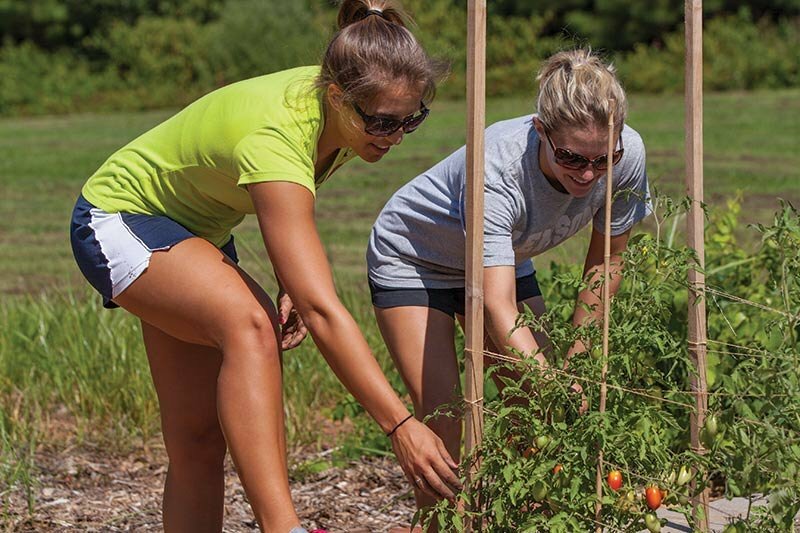 The Dickson Foundation Community Garden is a place for the whole campus community to come together. Often people pick up lessons in vegetable cultivation and the weekly farm stand offers fresh produce. The campus community can also sign up for Meredith Supported Agriculture (MSA) baskets. Plant waste from the garden, the food and nutrition program food labs, and the dining hall are collected and used for a pilot project that demonstrates the feasibility of a larger scale composting operation. This gift will allow the garden to expand. Some uses of the funds will be fencing, signage for the garden, a land lab for nutrition students to conduct research, new plantings to extend or replace original plants, student stipends to conduct research and maintain the garden, undergraduate research materials, and faculty stipends.